Did you know last month a United States team played in, and won, a major international sports event? I’m not talking about the Mike Krzyzewski coached, highly paid, overly endorsed, NBA employed hoops team that came away from the FIBA World Championship tournament undefeated, virtually untested, and victorious for the second straight time. The American champions of which I speak was a three man team of amazing amateur golfers that travelled half way around the globe, played 72 holes and in an incredibly tense, action packed, down to the final putt drama claimed the World Amateur Team Championship for the second time in a row. 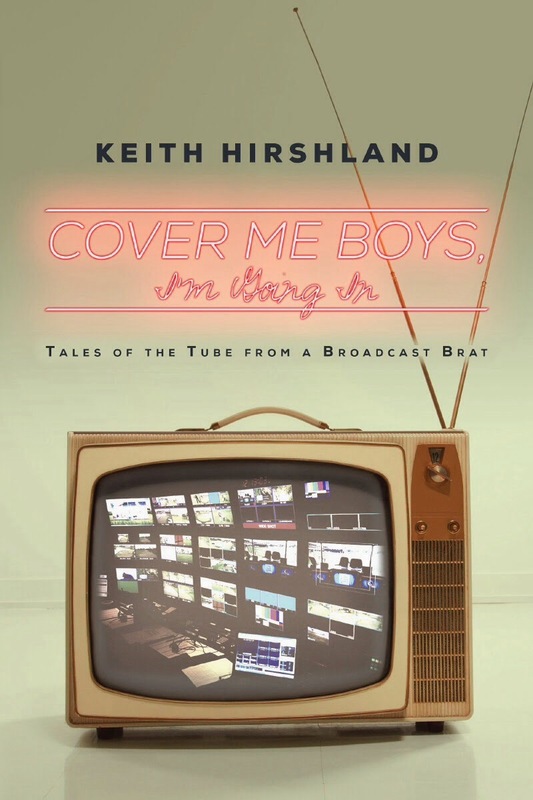 I produced USGA amateur championships on TV for The Golf Channel for nearly a decade and the only thing I knew about the World Amateur Team Championship was that it was played in even years at the end of the United States Golf Association’s championship season. 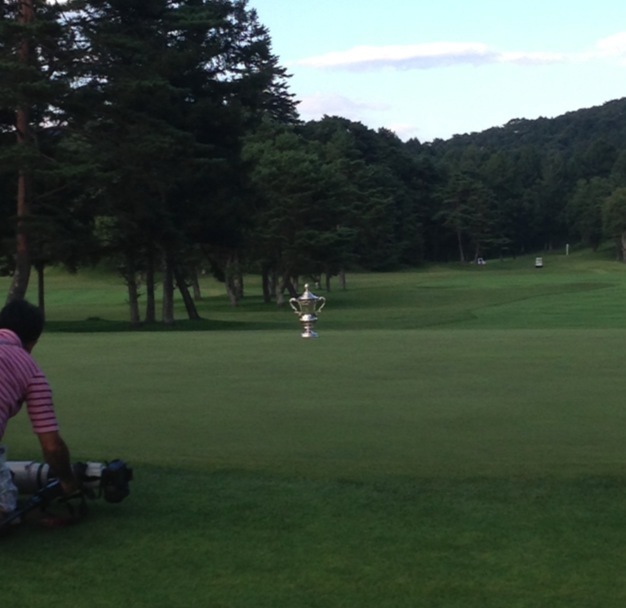 After getting the opportunity to see it in person at the Karuizawa 72 Golf East Iriyama Course, near Nagano, Japan, this month I wish I had paid closer attention. It’s an historically important and terrifically exciting event and here’s why. IT HAS HISTORY – If you are a golf fan, even a casual one, you know the 34th President of the United States was an avid golfer. Dwight David Eisenhower had a loblolly pine on the 17th hole at Augusta National named after him. I say had because storm damage to the tree this spring forced the club to remove this well-known landmark. The 66 foot tall tree is now gone but another golf namesake remains – The Eisenhower Trophy, the prize for which amateur teams from all over the globe have been competing since 1958. The competition was born in 1957 out of a desire by the Japanese to play a match against its American equivalents. Since, for years, the USGA had entertained like requests from other countries, the organization decided it was time to suggest a team competition and soon after approved, in principle, a plan for an event that would pit amateur teams from all interested countries against each other in a true world championship. They then met with counterparts at the R&A who liked the idea and agreed to host the very first competition, later that year, at St. Andrews (how cool is that?). 115 players from 29 countries, including the U.S.A. captained by Bobby Jones (how cool is that! ), competed. Australia, led by Bruce Devlin, beat the U.S. in a playoff. The event was considered a rousing success and plans were made for a second iteration, this time in the states at Merion Golf Club, two years later. In 1960 Jack Nicklaus was the best amateur golfer in the land and that year he would play for team U.S.A. and lead the Americans to their first Eisenhower Trophy victory. IT FEATURES FUTURE SUPERSTARS – I mentioned Nicklaus and in addition to the Golden Bear, the American teams, as well as other countries, have been represented throughout the course of the competition by amateurs who would go on to become the game’s greats. Tom Kite (1970), Ben Crenshaw (’72), Curtis Strange (’74), Phil Mickelson (’90), David Duval (’92), Justin Leonard (’92), Tiger Woods (’94), Matt Kuchar (’98), Rickie Fowler (’08) and Billy Horschel (’08) are just some of the players to wear the red, white and blue. Nick Price (’76), Colin Montgomerie (’84), Jose Maria Olazabal (’84), Sergio Garcia (’96 & ’98), Luke Donald (’00), Martin Kaymer (‘04), Rory McIlroy (’08) and many others represented their countries in the competition. The Women’s World Amateur Team Championship was added in 1964 and, like its male counterpart, featured many of the game’s greats before they were famous. Annika Sorenstam, Karrie Webb, Se Ri Pak, Lorena Ochoa, Helen Alfredsson, Yani Tseng and Ai Miyazato all wore their country’s colors. Many more including Sally Little, Mi Hyun Kim, Anna Nordquist, Katherine Hull, Azahara Munoz, and Liselotte Neuman played in the past. The American team, winners 13 times in 26 tries, has been represented through the years by Nancy Lopez, Juli Inkster, Beth Daniel, Pat Hurst, Kelli Kuehne, Paula Creamer and Jessica Korda. Other American players include Kay Cockerill, Vicki Goetze Ackerman, Wendy Ward and Carol Semple Thompson. It’s clear if you want an early look at amateurs who will be in future professional winner’s circles the World Amateur Team Championship and the Women’s World Amateur Team Championship is a good place to start. IT TRAVELS ALL OVER THE WORLD- As previously mentioned the first two events were played at St. Andrews and Merion. It has also been played at Pinehurst and Royal Melbourne and in Fiji (where Clampett’s team won), Hong Kong, Caracas and Versailles just to name a few. The championship rotates between Europe/Africa, Asia and the Americas. In 2012 it was staged in Antalya, Turkey, this year Japan was the host country and in 2016 the WATC will be played in Mexico. 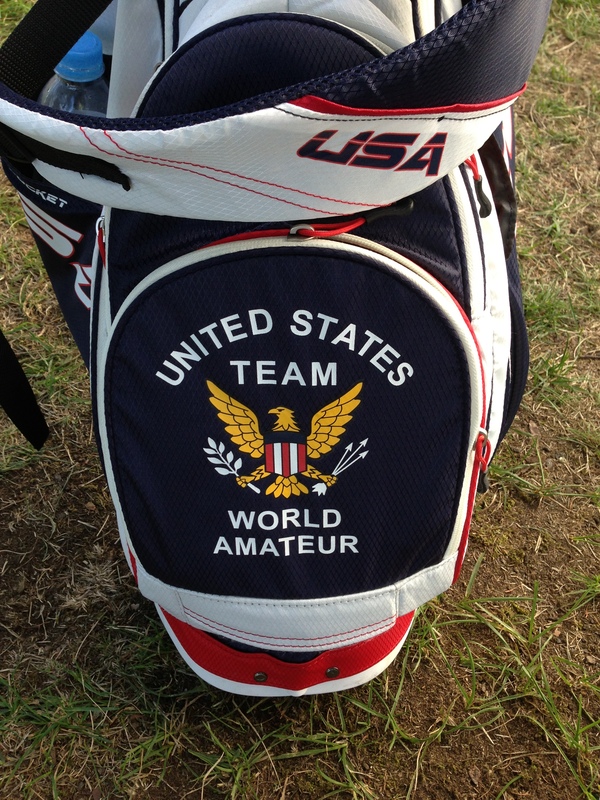 THE COMPETITION LENDS ITSELF TO EXCITEMENT- Team U.S.A has won 14 of the 29 World Amateur Team Championship titles (including 2014) but the competition, in many cases, has been exciting and close. Starting with the very first one, 11 of the 24 have been decided by three shots or less. Keep in mind that’s total combined strokes for three players over four rounds of golf. In fact, before 2002 the teams were made up of four players, making the closeness of the competition even more impressive. 2014’s event was one of the closest in the championship’s history and we were lucky enough to be there for the final day. My wife, my daughter and her boyfriend, (who both live and work in Tokyo) and I bought a box of Tokyo Bananas (if you or anyone you know has been there you know of which I speak) and boarded an early morning Shinkansen “bullet” train from Tokyo to Karuizawa. The train is part of the world’s largest high speed rail line transporting more than 150 million passengers a year at speeds in excess of 175 miles an hour. 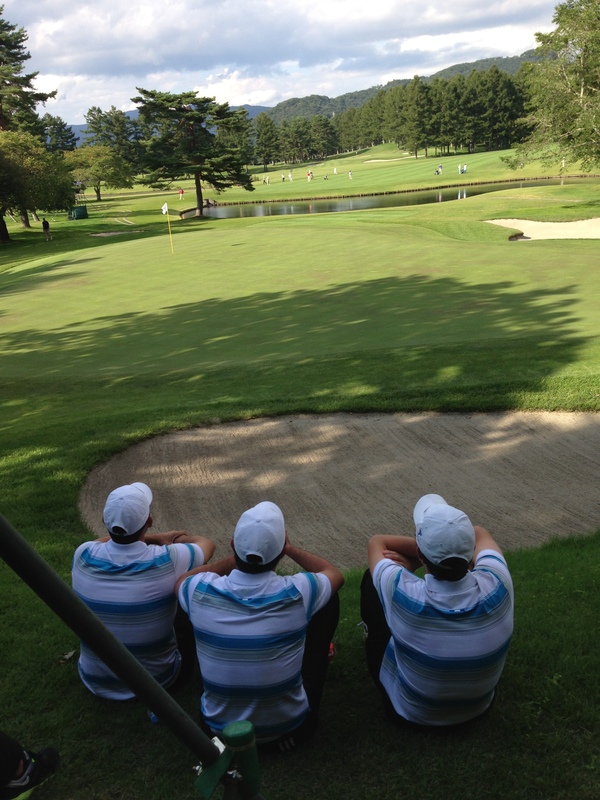 I’ll have more on our fabulous trip to Japan in future posts but for now back to the golf. 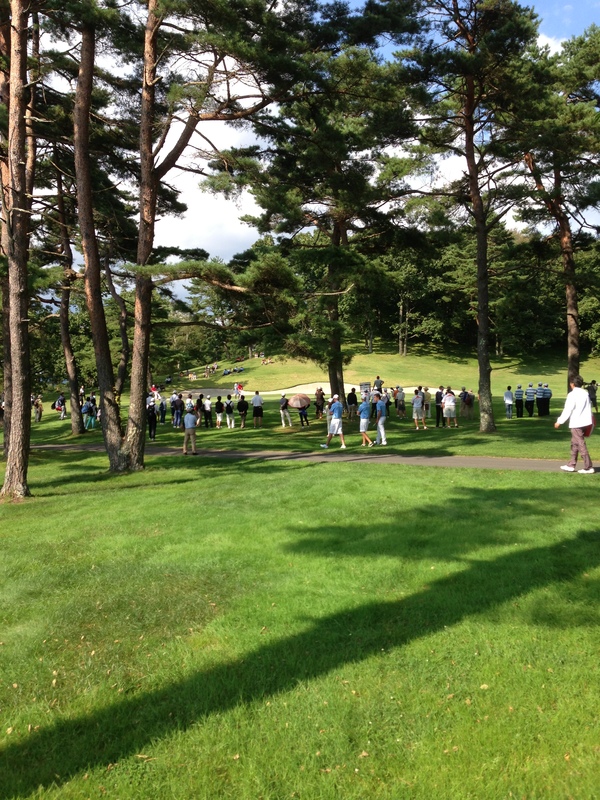 We arrived at the Karuizawa 72 east golf complex in the early afternoon. The club, this day fronted by the colorful, flapping flags from each of the 68 countries represented, is a sprawling site featuring six, 18-hole layouts. We found the media trailer and USGA Director of Communications Pete Kowalski who greeted us with a smile. Pete had been in Japan for more than two weeks having led the USGA’s communications efforts for the Women’s World Amateur Team Championship (won by Australia by two shots over Canada) the week before. Pete complimented both the International Golf Federation and the Japan Golf Federation for their efforts and mentioned that he was ready to go home. We were ready to watch some live golf. 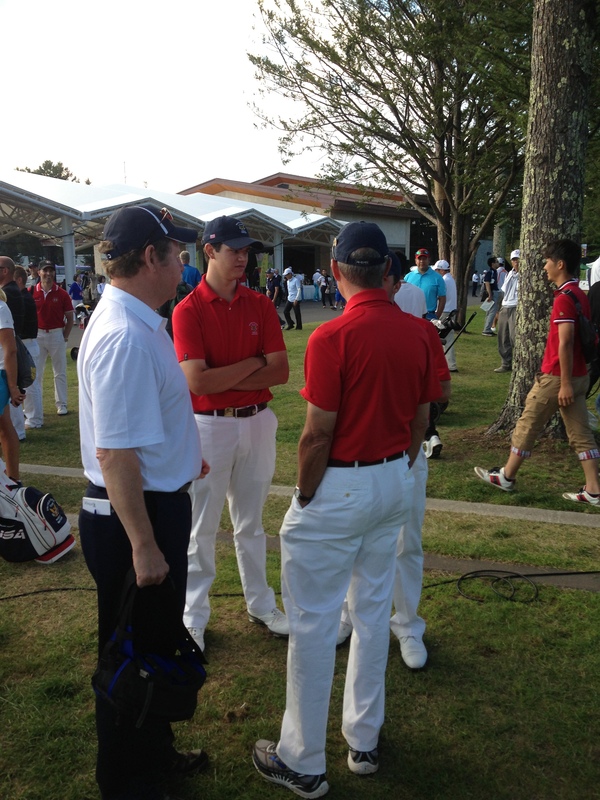 Pete handed us credentials, informed us that Team U.S.A. was leading thanks to the play of Denny McCarthy who had turned in 8 under par 28, and pointed us in the direction of the Iriyama courses’ back nine. The U.S. team was comprised of McCarthy (third to last grouping), Beau Hossler (penultimate group), and Bryson DeChambeau in the final grouping. All three were joined by players from Canada, who entered the final round in second place three shots back, and Sweden, the third place team after 54 holes. DeChambeau, the All-America Team selection from SMU had been the U.S.A. star thanks to a six straight birdie finish 61 on Saturday. But McCarthy, a senior at the University of Virginia, was looking to upstage his teammate with a birdie, birdie, birdie, birdie, eagle start on the final day. By the time we caught up to him on the 13th green his torrid start had turned tepid thanks to five straight pars. Despite that, the numbers on the board carried by the standard bearer indicated McCarthy still had a five shot lead over his Team Canada counterpart, Adam Svensson. Three guys play for each team and when they add them all up the two best scores count. McCarthy had a firm grip on his group so after he teed off and eventually parred the 14th we stayed and waited on the par three for the last two groups. Hossler came first and then DeChambeau followed and both were over par and behind the Canadian players. “Uh oh”, I thought as I tried to do the math in my head. The U.S.A. had entered the final round with a three shot lead and McCarthy, through 14, led by 5 so that was 8 shots to the good. Between Hossler and DeChambeau only one score would count but both were behind so even my math challenged mind knew things were close. Thankfully there was an electronic scoreboard in the same area between the 14th and 18th tees and the 17th green and it confirmed my fears. Team U.S.A. had a lead by the slimmest of margins, one shot. And that was with a cooled off McCarthy and Hossler and DeChambeau struggling. We made our way, along with a few dozen golf fans from all over the world, to the area behind 17 green to watch the final groups play their approach shots and putts to the par four. On the way we ran into Team U.S.A. captain and past USGA President Jim Hyler who admitted to being, “ready to jump out of my skin, I’m so nervous.” He had no entourage, no radio and since he couldn’t be in three places at once he relied on his wife and his players who, carrying their own bags, walked by and reported individual updates. We watched Beau Hossler miss a relatively short birdie putt at 17 and then Canadian Taylor Pendreth make one. As we headed to 18 to watch the finish the abacus in my head told me the U.S. could not have held on to its slimmest of slim leads. Both Hossler and Pendreth made par at the last but we learned from USGA rules guru Jeff Hall that McCarthy had bogeyed 18 and with just one more grouping on the golf course Team U.S.A. and Canada were tied! I asked if there would be a playoff and Hall answered with a slight smile and a negative shake of his head. Then he added, “There’s a tiebreaker in place and it doesn’t look good for the U.S.A.” DeChambeau was going to have to beat Corey Conners on the 72nd hole for the U.S.A. to win so we watched as they both hit tee shots in the fairway. DeChambeau would play first and he executed well hitting a wedge pin high right, just inside ten feet. Connors was next and after a brief discussion with a confident he hit a wedge of his own. Whether a result of adrenaline or the wrong club, Connors wedge sailed long and ended up near the back of the green more than 30 feet from the hole. If Connors missed and DeChambeau could make, U.S.A. would win the World Amateur Team Championship. Both seemed more than possible, if not likely. By this time nearly every fan on site and most of the other teams who were involved in the competition ringed the 18th green, 6 or 7 people deep. Connors did, in fact, miss and as DeChambeau circled his putt with the knowledge of what a make would mean I thought two things. 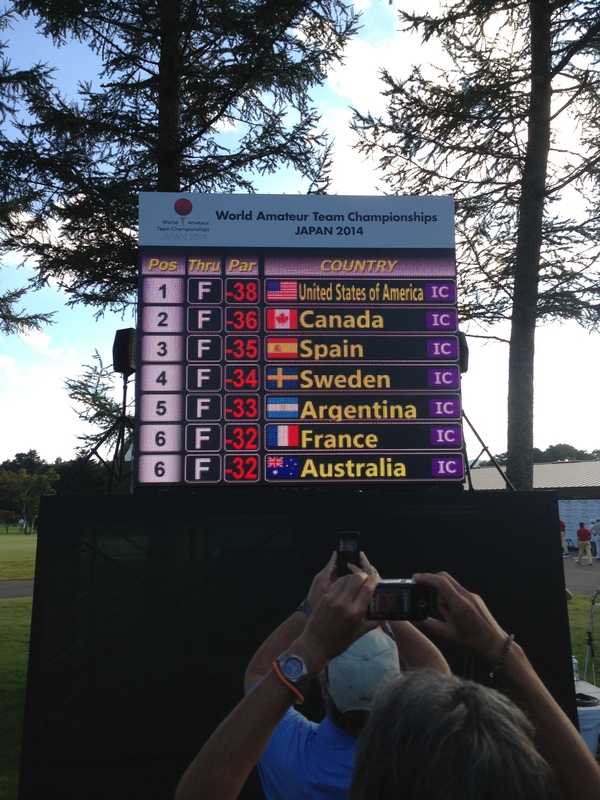 The first was this is what Olympic golf should look like! Three person teams playing 72 holes, best two scores count each day and when it’s done hand out team and individual medals. It would also be nice if all the players were amateurs but that’s just my old school opinion. The second thing I thought was why isn’t this event on TV? People from all over the world were gathered around the final green, craning necks and biting nails knowing a world championship was on the line. Teams, wearing colors, from Slovenia, Portugal, Bermuda, Korea, The Czech Republic, India, Bahrain, Costa Rica, Iran, Jamaica, Gabon, Kyrgyzstan even Russia AND Ukraine all watched American and fellow golfer Bryson DeChambeau line up the winning putt. I imagined FOX golf director Steve Beim milking every emotion out of the moment then training his cameras on the American as he poured in the winning putt. It was an incredibly emotional moment and perfect theatre for television. But I realized that it’s not televised because too few people either know or care that it exists and THAT is a damn shame. FOX, the USGA’s TV partner for the next 12 years will do what previous partner NBC did for the past 18 and dismiss it as too expensive. Realistically the USGA won’t push them to reconsider, but I wish both would change their minds. No offense to the U. S. Junior Amateur or the Girl’s Junior Amateur but during even numbered years I would much rather watch this than those. Future stars, worldwide inclusion and incredibly close and compelling competition wins over two 14 year olds playing match play any day in my book. As for the expense, I know it would be cost prohibitive but there were cameras there because the Japanese were streaming the last few holes live on the internet. Maybe supplemental coverage with the host country could work. In 2016 the World Amateur Team Championship is in Mexico further cutting the costs of International production. Networks already televise events from professional tours when they are played both north and south of the border. Congratulations to Bryson DeChambeau, Denny McCarthy and Beau Hossler for winning the Eisenhower Trophy. I also offer a well-deserved, worldwide golf clap to the USGA, the IGF and the JGA and finally, an enthusiastic fist pump and a tip of the cap to all the players and organizations from the 68 countries that participated. Well played. This event has a new fan and I am hopeful all of you will join me in paying closer attention to it in 2016. In my opinion the World Amateur Team Championship will be the truer example of pure international golf competition that year. This entry was posted in general observations, Golf, golf on tv, sports and tagged Annika Sorenstam, Beau Hossler, Bobby Clampett, Bryson DeChambeau, Denny McCarthy, Dwight D. Eisenhower, FOX, IGF, Japan, JGA, Juli Inkster, Karuizawa, Kay Cockerill, Lorena Ochoa, Nancy Lopez, Phil Mickelson, Rory McIlroy, Tiger Woods, Tokyo Banana, USGA, WATC. Bookmark the permalink.